It was 2008 when I walked into the transport office and nervously asked to take my motorcycle learner’s written test. I was 27. For me, learning to ride was about a pure, instinctual pleasure. That pleasure that pulsates through your body when you ease on the throttle and feel the mechanical horses propelling you forward into a sense of euphoric freedom. These early days of riding were really about knowing that motorcycling added a new level of adventure into my very conventional ‘9 to 5’ lifestyle. After graduating with a psychology degree nearly five years earlier, I was working with a largely female client base to empower them to reach both social and employment goals. Working in this role did not only allow me to help my clients reach empowerment, but it also helped me to explore my own development. Who did I want to be? Although my husband and I had talked often about travelling the world together on bikes, it was never the ‘right’ time. The conventional lifestyle turned to boredom and before we knew it, we were at a crossroad. Unfulfilled, we decided to try to life out as individuals, after 16 years together. For the first time, I was alone with my motorcycle. I felt a very sudden, and very real, sense of extreme vulnerability whenever I rode my bike. I felt completely exposed to the road, to the elements, to others and to myself. When we feel uncomfortable our first instinct is to turn away and to seek safety. But it is from this sense of uncomfortableness that we grow. So, I let it in, examined its elements and watched with curiosity as it snaked its way around my very core. It was then I realised what a profound impact motorcycling has had on my life. This vulnerability is the fundamental element of human relationships – accepting our vulnerability allows us to experience all that this life has to offer us, without fear of ourselves. All of a sudden, I felt like a superwoman! Within a year, my husband and I reunited and I shared these reflections with him. I was surprised to hear that he too had watched me evolve through my motorcycling journey, but from a different perspective to my own. I wondered if this was a common experience. Do other men have expectations on how motorcycling will impact on their partners lives and what changes do they witness in their partners? Paul and Rachel Sumner have been together for 29 years, with Paul riding since 1990 and Rachel learning to ride in 2001. Paul was excited for Rachel to learn to ride and expected that she would experience an increased sense of accomplishment during their motorbiking adventures. 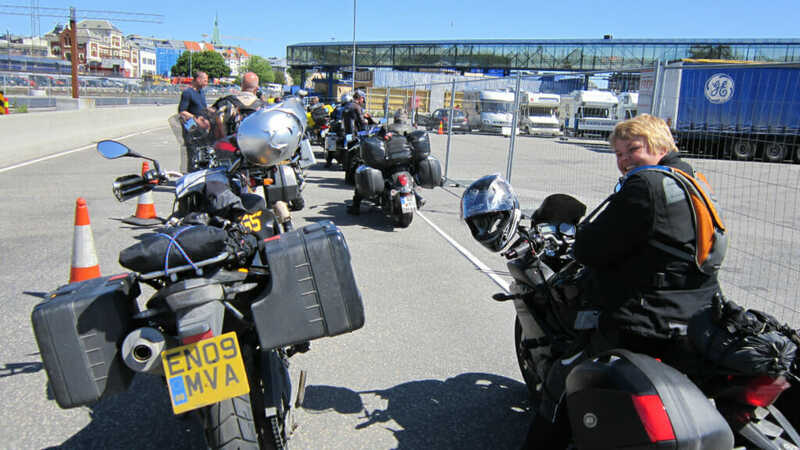 Jumping out of the pillion seat and onto a BMW G650GS, Rachel rode 10,000 miles across Europe, reaching Nordkapp in northern Norway. Paul describes this ride as the highlight of Rachel’s riding career. After suffering a serious injury, Rachel is not currently riding her own bike, Paul noting that his expectations of her have now changed, quoting “I will neither encourage or discourage her to ride, which is different from how I was at the beginning”. It appears that the men contributing to this article expected motorcycling to open up a new world to their partners and enhance the quality of their relationship through the sharing of a mutual interest and sense of accomplishment. One that the male partners were sure fitted their significant others personalities and outlook on life. Adam Lawrence and Michelle Georgilas have been together for 10 years. 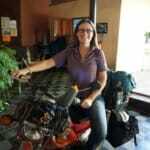 Adam was sure that the motorcycling community would complement Michelle’s personality due to her love of the outdoors and adventurous spirit. Whilst Michelle rode dirt bikes as a child, she did not actively pursue riding until after she and Adam commenced dating. Adam describes being a strong influencer in her decision to recommence riding, “I convinced her to buy a bike so she and I could ride together around town. I was ecstatic when that became a reality”. 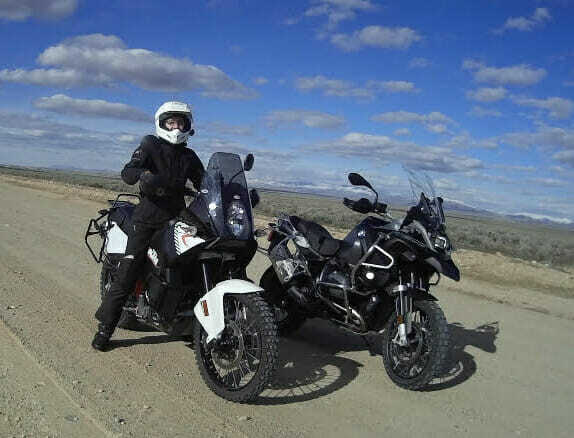 Adam and Michelle, riding a BMW 1200GSA and a Kawasaki KLR650 respectively, have completed several epic rides together and Adam believes the riding experience has helped to strengthen Michelle’s self-reliance through the process of learning to ride off road, performing her own maintenance, purchasing and installing farkles herself and dealing with the issues that come up during any long distance motorcycle adventure. This sentiment is echoed by Stephen Hogg, who is currently riding from Australia to London with his partner, Celia Neilson. Not long after completing a trip from Alaska to Argentina on a scooter, Stephen met Celia and was soon encouraging her to learn to ride. After a quick midnight lesson on a Vespa clone in a warehouse carpark, Celia was riding her own 150cc scooter, legally, the very next day. 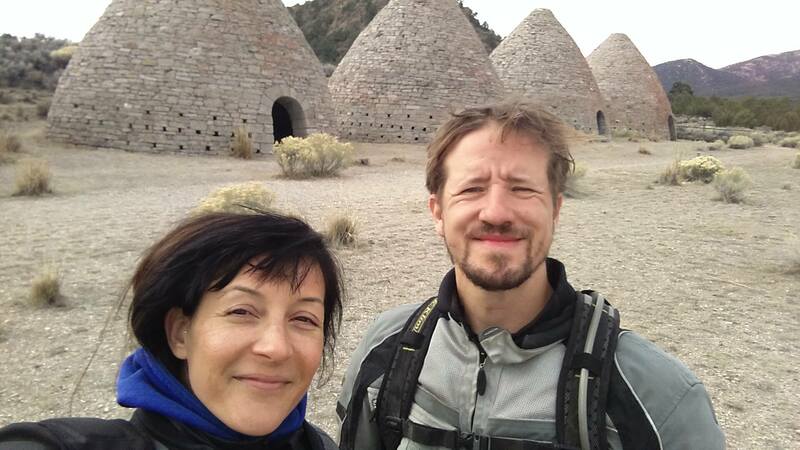 Stephen was excited to share his love of adventuring by motorcycle with Celia and expected that she would develop resilience throughout the experience. 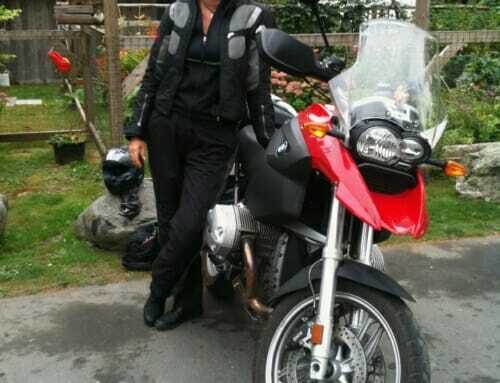 Whilst in the planning stages of their trip, Stephen was initially concerned that embarking on a long distance motorcycle journey so early in her riding career might have a negative impact on Celia’s riding future. Stephens concerns appear unfounded however, as he now describes Celia as a ‘life long rider’, and one that is able to remain calm in the face adversity, whether this is related to governmental, social or motorcycle issues on the road. For Stephen, this calm composure means that he can always count on Celia when the going gets rough on the road. Sharing the difficulties together, from extreme weather to being confronted by an angry mob in Kashmir has “re-shaped our view of the world and I think when you are riding on your bike you are immersed in the experience; you feel it all and you have to clean it off your face at the end of the day. It makes it all very real”. It is to be expected that couples who share a passion develop a bond based on their mutual experiences. This is especially true of such couples as Stephen and Celia, Adam and Michelle and Paul and Rachel, who have faced the triumphs and difficulties of long distance motorcycle travel. These couples all describe these experiences as enhancing their relationship, and as recalled by Stephen Hogg, it is the difficult times that become memorable highlights of the couples shared riding exploits. Interestingly, Lance Gines reports the same increase in relationship satisfaction with his wife, Ellen Gines, without experiencing a long distance motorcycle adventure together. Lance has been riding a variety of adventure and dirt bikes his entire life, while Ellen only expressed an interest in learning to ride more recently. 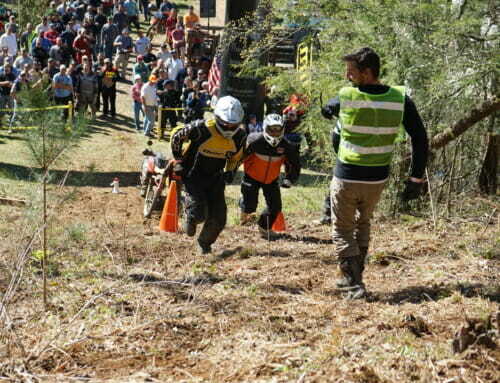 Ellen commenced riding two years ago, and was the last member of the family to do so, with their children active participants in the dirt biking scene. Lance reports that Ellen’s foray into the biking world has led to an increased closeness in their relationship through a greater appreciation of actively making time for each other. “I am very excited and impressed with her riding abilities and how quickly she has improved. She is getting to be a very good rider and I love when we get to ride together” states Lance. This raised another interesting and unexpected point. Lance’s approach to riding changed as he witnessed Ellen’s learning journey. “Riding with her and teaching her has made me think more about what I am doing as a rider and why I do what I do. I am less aggressive when I ride with her”. This soon become a familiar viewpoint, with Paul, Adam and Stephen all reporting similar changes in their riding styles. Riding with their female partners has encouraged these riders to reconsider their approach, from a more aggressive style to a more aware and considered technique. Reflecting on this, it appears men often have a significant influence on their partner’s decision to learn to ride, but with expectations that this experience will magnify the relationship experience and deepen the level of intimacy within the relationship. Aside from assisting women to develop self-confidence and important resilience skills, it also has a positive impact on the men in the relationship. 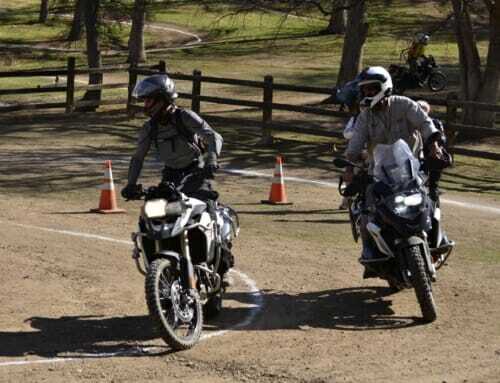 Males are traditionally greater risk takers than females, so riding with their female partners encourages them to explore less aggressive methods of approaching both on road and off road riding techniques. “It’s one of those endeavors that will come with highs and lows and can bring out the best and the worst in people! Be supportive, relax, listen to your partner and you’ll have an awesome time together. 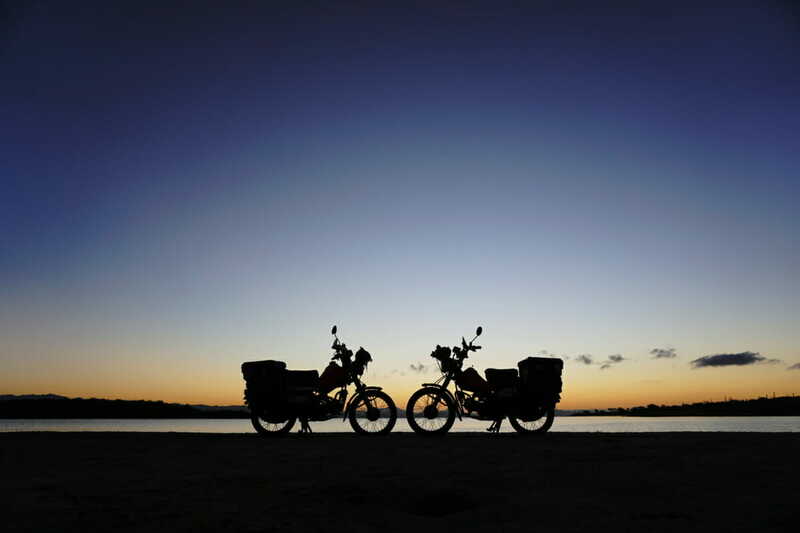 If you’re planning an overland trip together, go for it! Don’t be overwhelmed by the what if’s, it’s just riding your bike each day, somewhere new and interesting with someone you care about”. Chantelle started riding in 2008 at the age of 27. 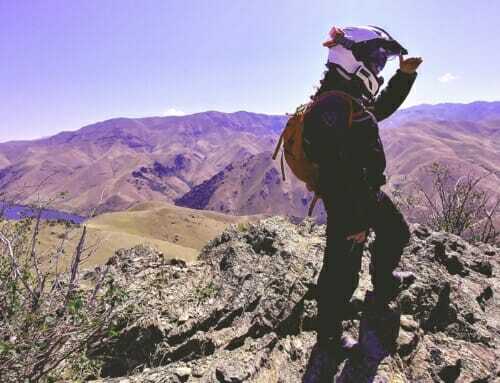 After a wine induced decision to ride the world, she purchased a Suzuki DR650 and set about learning to ride off road in early 2010. 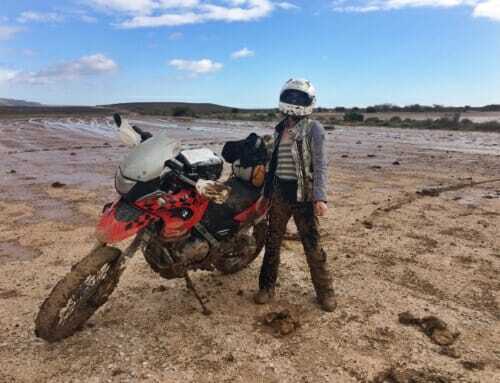 After a number of years procrastinating, she left in March 2016 on her steed ‘Rosie’, with her husband and his bike ‘Mabel’, to venture around the world. The choice of motorcycles? The rather unconventional Honda CT110 – the iconic Australian ‘Postie Bike’.